Like the parted kimono, the sounds were unsettling; the silence was most unsettling of all. Sitting at her bureau a short time before, Frances had been picturing her lodgers in purely mercenary terms — as something like two great waddling shillings. But this, she thought, shuffling backward over the tiles, this was what it really meant to have lodgers: this odd, unintimate proximity, this rather peeled-back moment, where the only thing between herself and a naked Mrs Barber was a few feet of kitchen and a thin scullery door. An image sprang into her head: that round flesh, crimsoning in the heat. Set in 1922, The Paying Guests tells the story of Frances Wray, a single woman in her mid twenties who’s struggling to adjust to the post-war world. Like many other impoverish genteel families, Frances and her mother live in a mostly empty house they can hardly afford to keep, and which is full of pictures of the deceased. The Great War took Frances’ two brothers, and when her father died of a stroke, Frances and her mother discovered that the family money was very nearly gone. The household staff was dismissed, and to her mother’s distress Frances started doing the housekeeping and cleaning herself. But even then it’s difficult to make ends meet, and so the two decide to take in lodgers — or, as the neighbours delicately put it, “paying guests”: Leonard and Lillian Barber, a young couple of the nascent “clerk class”. The years around the Great War, however, weren’t only a time of losses: Frances also fell in love with Christina, a girl she met at a suffrage march. But neither Frances’ nor Christina’s family reacted well to the fact that the two were lesbians, and the resulting tensions drove them apart. Frances remains friends with Christina, and sometimes visits her in her flat in Bloomsbury — a welcome respite from suburban Champion Hill. But the life the two could have lived together seems to her forever gone. Frances, who during the War “believe in transformation” and that “nothing could ever be the same”, feels trapped in her current life; but her growing intimacy with Lillian Barber slowly begins to show her new possibilities. Until, that is, an unexpected turn of fate tries the two nearly beyond endurance. As Jenny said: Sarah Waters, why are you so good at being a writer? I loved The Paying Guests. I loved the detail, the slow build up of tension, the deft portrayal of growing intimacy, the social insight. I thought it was especially interesting that the first part covered some of the same territory as The Little Stranger. It’s set in a different period and examines the shockwaves of a different war, but both are novels about people trying to make sense of a quickly shifting social world. As in her previous novel, Sarah Waters writes about the everyday manifestations of class with delicacy and incisiveness. We learn about the subtle shifts in standing that the Barbers’ move to Champion Hill bring to both them and the Wrys; we watch Mrs Wry’s anguish over her daughter being “reduced” to doing manual labour; we see Frances herself, a suffrage activist who longs for a different world, struggle with changes that go against the worldview within which she was raised. 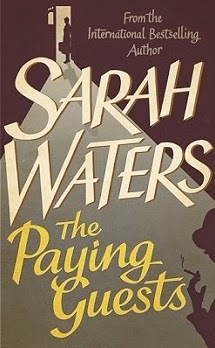 The Paying Guests is, then, a novel about social upheaval, but it’s also very much about the disappointment of women who found themselves caught in a forceful attempt at a return to “business as usual” after the war. It’s not unusual for periods of quick and intensive change to be followed by backlash: change leads to anxiety, which leads to desperate attempts to revert it, which leads to a greater than usual policing of social behaviours. This kind of scrutiny is very much a part of Frances’ environment in Champion Hill, and it’s part of why she longs to escape it. Frances, who was once arrested for throwing a shoe at an MP, feels forced back into the role of the dutiful daughter, who spends her evenings reading companionably or playing cards with a mother she’s not particularly close with. The pressure is of course not only external — Frances longs to escape, but she also struggles to make sense of what it would mean to leave her mother. Would Mrs Wry be okay? Would Frances herself be okay? Would such a decision make her a degenerate and unfeeling daughter? Is putting herself first something a woman like Frances could ever allow herself to do? But their hands met as they did it, and they twitched away from each other; everything between them was wrong, off kilter. The hilarity of the past hour, the beauty-parlour silliness, the slipping in and out of clothes—it had all evaporated. Or, worse than that, it had all, Frances supposed, become suspect, become charged and tarnished by her confession. Lillian was tidying away the scissors and the combs now, looking almost angry. Frances had never before seen her look anything but open and kind. Was her mind running backward? Was she remembering odd incidents between Frances and herself, the Turkish delight, the chivalry, Frances chasing away her admirer from the band-stand? Was she thinking that Frances had seen him off in order to take his place? Was that what Frances had done? This final sentence is, I think, particularly striking, and it gets at something The Paying Guests does especially well. It captures the fact that Frances and Lillian are doubly vulnerable because being two women in love is something outside of what society recognises as legitimate. Frances knows that nearly everyone would reduce their relationship to something lewd and base, to something tarnished, and it often takes all her strength not to let those voices get inside her head. In the face of what the two eventually go through, it takes a lot for them to be open and trustful and find their way back to each other. Seeing Frances reject the view that what she and Lillian share is tainted and compromised by default and that the two therefore deserve punishment was the act of subversion I so desperately hoped for in this novel. There will be spoilers from this point onwards. I was rooting for Frances and Lillian all along. It seemed clear to me that Leonard’s death was self-defence, though I understood how they came to doubt it, and each other. And I was fascinated by how the event and its aftermath destroyed the remaining of Frances’ illusions of a well-ordered world. When an innocent man is accused of killing Leonard, Frances initially believes that there’s no way he will be hanged, because after all he didn’t do it — surely this fact will surface and that will be that. But the young man in question matches most people’s idea of what the killer must be like all too well — and that, Frances realises, bears far more weight than the facts. In a similar way, people like Frances and Lillian have no legal recourse. The two wrestle and wrestle with whether they should come clean about what happened, but their fear for their lives wins in the end. I was cheering for them not to get caught because it was evident that they couldn’t possibly expect a fair trial. Frances might have been protected by her class, but the two are doomed because they’re women, because they’re gay, because Lillian sought out an abortion. The court of public opinion would convict them from the start, and the law would soon follow. The odds are so overwhelmingly stacked against them that their only hope is in deception. The main ethical question Frances and Lillian grapple with, then, is less about telling the truth and more about what they can and can’t live with. They can, though with effort, live with not going to prison for killing Leonard in self-defence; watching an innocent man be hanged on their behalf is another matter altogether. I loved every page of The Paying Guests, but it was the ending that elevated it to an extraordinary novel for me. I suspect that a lot of other writers would have felt the need to dole out narrative punishment to Frances and Lillian, and I confess that I was on tenterhooks about whether or not Sarah Waters would until the very end. Oh me of little faith! Perhaps it’s because she was written truly heartbreaking novels like Affinity, but still, I should have remembered that this is Sarah Waters. It matters to me to see characters like Frances and Lillian “make one small brave thing happen”, and I was thrilled that this was exactly what we got. I can’t. They were a queer two words by which to be reunited: a statement of failure, Frances though, as much as of love. But they were like the two words that the jury had brought back: the moment she heard them she began to shake, to imagine if they had not been said. Lillian saw, and put a hand over hers; and presently the trembling passed away. They didn’t try to speak again. They learned together by an inch—that was all it took, after all, to close the space between them. Would it be alright, wondered Frances, if they were to allow themselves to be happy? Wouldn’t it be a sort of insult to all those who had been harmed? Or oughtn’t they to do all they could—didn’t they almost have a duty—to make one small brave thing happen at last? My heart. My poor, poor heart. It very nearly exploded, in the best possible way. As I said above, I read this as Frances and Lillian’s rejection of the idea that women like them have unhappiness coming, and that was lovely to see. All this time, [Frances] had imagined herself to be entirely without hope, but she had had hope, she realised: it had all been pinned on this moment, when at last, after so many weeks, the boy would have the chance to put his own case, clear up every scrap of confusion. But how could he possibly do it? How could anyone have done it, in that crushing, unnatural place, with so many greedy eyes on them, and with everyone present save herself and Lillian convinced of their guilt? She began to walk. The rain had turned into a fine drizzle, and the pavements were slimy. Her boots began to let in the filthy water at once. But as she made the long journey home to Champion Hill she felt what she had tried and failed to feel the day before: she looked at the city and was sick with love for it, sick with yearning to remain a part of it, to remain alive and young and unconfined and bursting with sensation. Her tired muscles began to ache, but even the ache was dear to her, even the blisters on her heels. She'd be a thing of aches and blisters for the rest of her days, she thought; she'd ask for nothing, trouble no one; if only they’d let her keep her life. I skipped your spoilers because I really want to read this. I've only read one Waters - The Little Stranger - and really liked it. I MUST make time for her other novels. Such a wonderful book, though I admit I was very sad when it was over and felt totally "the wait's begun again for that rare and random descent" about it. But on the plus side, I thought The Paying Guests was completely worth the wait since The Little Stranger. My favorite moment by far was when Frances is fussing at Lillian, and Lillian says "I'm sorry you're not as brave as you thought you were" -- that was just devastating to me. I had been admiring Frances's bravery all along, and it was painful to watch her try and reconcile her self-image with her present behavior. I really must read more Waters. I've loved the two I've read, and I can't for the life of me figure out why I haven't read more. I admit I did not love this book, but I do appreciate all your points above about the women's powerlessness in the situation and how desperately you want them to move past the event and be happy together. I finished the book unsure of whether that would happen or not, which was quite devastating.